Ekiti State Governor, Dr Kayode Fayemi, has presented a 22-seater bus to the College of Medicine, Ekiti State University as part of steps to ensure that the college gets full accreditation for its MBBS programme, reports ITREALMS. 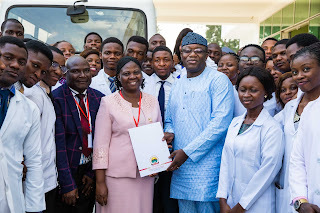 Presenting the bus to the Acting Vice Chancellor of the University, Prof. Olubunmi Ajayi, at the Governor’s Office, Ado-Ekiti on Wednesday, Governor Fayemi said it was unfortunate that the college has not been able to graduate any student for the past 10 years of its existence as a result of accreditation. He added that his administration will ensure that all logistics for the final accreditation of the College will be provided before the December MBBS final examination. The Governor said donating the bus to the college is a duty that the government owes the college and the medical students who have been denied graduation for years; stressing that any responsible and responsive government would not see anything extraordinary about the gesture. Fayemi said many parents had written to him to help salvage the situation and ensure their students graduate. He said his government would do everything within its power to ensure the students realise their ambition of graduating from the college and practising medicine. “This is not favour to the college; it is a duty that we owe it. I don’t want you to think there is anything particularly extraordinary. If government has not done it before now, it shows that government has not deemed it fit to carry out its own responsibilities to the university and the students and we don’t want to shirk that responsibility. “Ekiti State University in its wisdom has set up a College of Medicine. The purpose of setting up the college is to graduate Medical Doctors and it is taking us 10 years”. “It is unfortunate to have kept this brilliant set of young people here for 10 years. Our duty is to accelerate their graduation in the shortest possible time. It is already too late for at least the first two sets of the college to come out and be of service to the health sector. Be that as it may, whatever it will take to ensure that we enable the university do that, we will do, including the provision of what is needed for the accreditation of the college and the students”, he said. Receiving the bus key and particulars from the Governor, the Acting Vice Chancellor of the University, Prof. Ajayi thanked the governor for the kind gesture. She said the governor’s efforts are testaments to the fact that he had the interest of the university at heart right from the inception of his administration. The acting Vice chancellor said the varsity is already preparing for the accreditation which is scheduled for May ahead of the December final examination, adding that she was optimistic that the students will perform excellently. Prof Ajayi said the governor’s step will help the College actualize her long-term dreams with the conclusion of the accreditation process. Some of the medical students who had accompanied the University’s principal officers to receive the vehicle praised the Governor for working with the school management to ensure that the college get accredited. They pledge to serve the society with the best of their professional ability upon graduation. Present at the presentation event were the Secretary to the State Government, Mr Biodun Oyebanji, the Chief of Staff to the Governor, Mr Biodun Omoleye; Acting Head of Service, Mrs Olapeju Babafemi, Director General Office of Transformation and Service Delivery (OTSD), Prof Bolaji Aluko and the Ekiti State University Registrar, Mr Akin Arogundade, among others.